Sudbury Steve May: Unexpected NDP Surge Derails Media-Scripted Election. Thank Goodness Something Has. Unexpected NDP Surge Derails Media-Scripted Election. Thank Goodness Something Has. Well, someone finally chucked out the media script for the election, and we’ve suddenly entered into uncharted territory. Throughout the day today, a number of polls have been released which show the NDP surging ahead of the Bloc Quebecois in Quebec. Further, the NDP appears to be tied in national polling with the Liberals. This wasn’t in anybody’s game plan. The NDP had a solid, if uninspiring, start to the election campaign. In the first few weeks, however, media interest in Layton began to wane, as the election fell into a media-driven faux campaign, with issues left behind in the dust in preference to stories about the election itself. Even today, it remains difficult for those who want to talk about issues to get much in the way of face time with the media. Clearly, election campaigns have degenerated into spectacle-driven popularity contests. And in such a contest, the unexpected appears to have happened. In both the English and French language leader’s debate, Jack Layton was perceived as the individual winner. This had more to do with his image than his policies; presentation again trumped substance. This doesn’t really surprise me. Layton is a popular and likable man, and the NDP certainly knows how to play it to the camera. If they spent as much time working on fully-costed policies as they do on promoting themselves through the media, it might be a Party that I could get a little more excited about. But I certainly can’t deny that when it comes to glitz and glam, the NDP has always outperformed. This is Jack Layton’s moment, and although I think that the surge is surprising him and the NDP handlers just as much as it’s surprising the media, this is exactly with the NDP have been hoping would happen (although not in their wildest dreams did they ever think that a breakthrough in Quebec would be leading the way). Apparently, in Quebec, they’re talking about the “Jack-istes” today, in reference to young, urban, francophone NDP supporters. We’ll have to see if those supporters translate into votes at the ballot box, however, as this age demographic has a bit of a reputation for staying at home (or more precisely, at the office or at the study hall) on election day, whereas the Bloc can count on solid support from an older demographic that enjoys casting a ballot, and indeed who still believe it’s their civic duty to do so. Good for the NDP, I say. I expect that their “dancing with the stars” moment will continue for the duration of the election. We could be witnessing a sea-change in Canadian politics here, folks, one which no one predicted. Of course, as the NDP moves ahead of the Liberals in voter intention, it’s quite possible that this will lead directly to a false majority Conservative government situation, as heretofore “hopeless” NDP candidates in lost ridings begin to appear to be viable to voters. This last quarter surge in popularity is certainly going to play havoc with those online strategic voting sites, that’s for sure. And I say good to that too, as I’ve always been opposed to the concept of strategic voting. If we end up with a false majority Conservative government, that’s the way it goes. It will be yet more ammunition to ditch our antiquated first-past-the-post electoral system. It might even convince the NDP that they need to actually do something about it, rather than just talk about it. A late NDP surge isn’t good for the Green Party, that’s for sure. It will more than likely lead to an increasing number of undecided voters to hop on Jack’s bandwagon. That’s really too bad for us, given that the NDP’s policies are often in direct contradiction to many of the things for which the Green Party stands, including the need to take serious action on fighting climate change. Sure, in one breath, the NDP says that they want to do more to reduce emissions. In the next breath, they’re talking about cutting taxes on fossil fuels which heat homes and regulating gas prices at the pump. They just don’t get it. Rather than providing hard-working people with real choices about how best to spend their money and putting a firm, easily predictable price on carbon, the NDP (along with the Liberals and the Bloc I hasten to add) seems to want to line the pockets of bankers and traders by imposing an emissions trading scheme on Canadian corporations. But when Jack Layton says that he’ll stand up to the oil companies on behalf of hard working families and the environment, he just sounds so gosh-darn convincing, doesn’t he? There’s no denying that Layton had a good couple of debates, although it wasn’t at all clear to me that he “won” either of them. What I can’t help but lament is how different all of this might have turned out for the Green Party had Canadians been given the opportunity to hear from Elizabeth May about the Green’s plans for Canada. While I couldn’t in my wildest dreams think that May’s participation in the Leader’s debates might have driven our Party’s support above the Bloc’s in Quebec, I’m equally sure that the NDP pundits never had such dreams either before this election’s debates. While we’re clearly starting to stray from the script provided by the media for this election, there remains no doubt in my mind that the election itself continues to be influenced to a significant degree by the media. In a campaign where style trumps substance every time, a Party that can put on the ritz and glitz is going to shine, given the opportunity to do so. The NDP have been masters at doing so, with Jack Layton playing the role of the charming, urbane rabble-rouser. After the Leader’s debates, the media handed him the opportunity to shine, and that’s what he’s done. Or do you believe that all of those stories about Ignatieff and Duceppe having to shift gears to combat Layton’s performance didn’t have an impact on today’s polling? There are a few things which are beginning to crystallize for me today. The first is that the national media has way too much influence in our democratic electoral process. The hype around the Leader’s debates, and the exclusion of a political party running candidates in just about every riding (made by faceless star-chamber oligarchs…and no, I’m not being over-dramatic) has had a significant impact on voting intention. Canadians need to know about candidates and political parties before casting their ballots, yet our national media has clearly not wanted to provide Canadians with an opportunity to find out more about the Green Party. I can’t help but wonder why that might be. Knowing the policies of the Green Party in the way that I do, I can’t help but think that maybe there’s something in those policies which might upset the corporate elite owners of much of our national newsmedia. The other thing that I’ve learned is that former Prime Minister Kim Campbell was right when she suggested that elections were no time to discuss policy (I’m paraphrasing here, obviously). Being a member of a political party which relies heavily on policy as a means of gaining public support, it’s clear to me that if the Green Party is going to experience much in the way of success in any election, we’re going to need to think about becoming more like the NDP, Liberals and Conservatives. Which is problematic, because the Green Party is kind of the antithesis of a political party. We pride ourselves on being unlike the other parties. Clearly, though, the NDP’s surge is pointing the way to success in Canadian politics (at least in a first-past-the-post electoral environment). Greens need more glitz and glam. And then we need to figure out a way to get ourselves noticed. Wow. And how much did writing those two sentences remind me of how I felt getting ready to attend a Grade 8 dance? But since politics today seems to be more about popularity, perhaps getting ready for a Grade 8 dance is exactly what we need to be planning for. Let’s head into an election looking our best, surrounded by our friends, and on the look out for more. When the music starts, rather than standing against the wall, engaging in conversation with other wonks like ourselves, we’ll need to strut our stuff on the dance floor. And when the journalism class comes to take our pictures, we’ll have to make sure that we pose just right, for even though we stumbled our moves a dozen times on the floor already, that one picture in tomorrow’s student paper is what is going to make or break us. How many phone numbers will we get then? Jack Layton and the NDP have just went through all of that, and on May the 2nd, they might be in receipt of a lot of new phone numbers. Elizabeth May has been doing all that she can to get noticed by the journalism student with the camera. Her moves on the dance floor are way better than anyone’s. But she must have done something to tick off the camera man, because no matter the moves, the coverage just isn’t coming. And the last thing that I’ve realized is that the Green Party just can’t be successful in that kind of circumstance, because that’s just not who we are. We’re not glitz over substance, and we never can be. So we’ll need to figure out another way to promote ourselves. The only other way that I can think of is by spreading our message, slowly but steadily, to one voter at a time. We’ve been paying far too much attention to trying to get the media on our side to do the communications job for us. Guess what? They’re not interested. So that means that we Green volunteers need to invest the time and energy into the slow and steady task of recruitment and messaging. We’re going to need help from the Party. Yes, we can use social media tools to help us out (and we absolutely have to). More than that, though, the Party is going to have to invest time and energy back into good old-fashioned organizing. We’ll never beat the other parties at their game of spin and confusion. But I believe today’s developments with the NDP are a good thing, because I very much want to take Jack Layton at his word when it comes to proportional representation. If a few more NDP MP’s in the House actually end up pushing for proportional representation, maybe as one of the items on which a minority government might have to concede if confidence is to be bestowed, all the better. When we have an electoral system in which every vote truly counts, that will be so much better for all NDP and Green supporters. So don’t set your bar for co-operation with the Liberals and Conservatives too low, Mr. Layton. You might have a significant, if unexpected, opportunity to influence public policy to a degree you’d not dare imagine. Don’t let Canadians down. You're right. It's been about the popularity contest, not the policies. Good analysis on the GPC's failings. The problem is that a lot of the volunteers, especially the experienced one, have left the party ranks. The institutional memory of the 2004 and 2006 (if not 2008 as well) elections is gone. There is a reason why volunteers could put together full 308 candidate slates in '04 and '06 yet paid staff couldn't in '08 and '11. My new blog is also looking at the NDP surge in the polls. Great post. Yes, the NDP doesn't have a perfect environmental platform - I'd prefer a carbon tax to cap-and-trade and the home heating rebate is a bad idea. Layton walks a fine line balancing the social activists, unionists, and environmentalists. However, I think things are tipping to the environmentalist side. 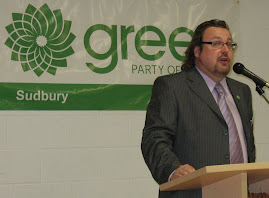 Some of the newest NDP MPs have a lot of green cred - Fin Donnelly and Linda Duncan. And Alexandra Morton has recently come out to support the NDP. From an environmentalists perspective, I think the biggest reason to vote NDP is the promise of proportional representation. We need Green MPs, and the only way that is going to happen is to change the voting system. The NDP is the only party with elected MPs promising a change.